At the moment this reveals mines to everyone if anyone comes across a mine regardless of their skill set or equipment, which I think this is a poor implementation of this difficulty setting. For this reason we have it disabled. I believe a better implementation would be. The mine is then revealed to all players and AI on that side and a marker showing the location of that mine is then created at that position on the map for that side. You don't need to be a extensively trained EOD professional in a bomb suit with the latest detection gear to say "Maybe don't step on that artillery shell with wires coming out of it in the middle of the road, mmmkay?" I can see maybe changing the range of knowledge, like if some random grunt finds one he marks it with spray point or something so you only know it's there if you're 50m away or something but if EOD marks it they run it up the chain and all datalinked units get a warning on their BLUFOR trackers about the location (ie, markers on the map and 200m view range of the symbol or something). Some player not even looking for mines, has the ability to reveal them to everyone else automatically just because the distance between him and the device is "X" meters. Can you really support that system ? 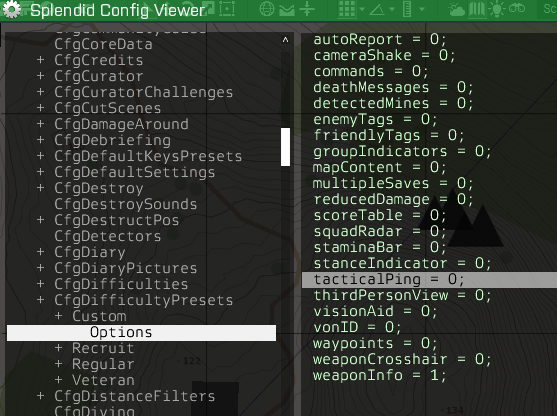 So my idea required an EOD Spec/Engineer equipped correctly (Or maybe any unit equipped with a mine detector) should be the only condition where mines are automatically marked on the map as and when the detector detects them (A Nice "Bleep" from the detector would also be better than some hint or system message). If a player comes across a mine/eod and does not have detecting equipment but can visually see them, then they can mark them on the map manually. edit: never mind. Figured it out. I have the same issue, would you mind sharing your solution? I think we should have both the ability to define multiple custom classes, and the ability to change custom settings as a logged in admin while the game is running. When you want to have 2 presets available for a server you will want the multiple classes, and when you want to try out a new option or change something without restarting the server, you will need the manual edit while server is running. Ultimately, it would be best if those custom configurations could be edited and saved by the logged in server admin (optionally disabled by server config). Of course, the current behavior should be left in for those who don't want to bother with it. "Automatic mine detection" or something that would only require you to have the detector on your person. But anyway there is no stamina-bar and stance-indicator, when I'm playing.... why??? The autoreport issue seems to have made a comeback. We are using the "custom" difficulty with autoreport set to 0. However, player characters are still calling out spotted enemies. All other values work as expected. whats the new command for activate/disable tactical ping? it seems that the difficulty setting is affecting the icon color in "high command" mode but I've been unable to pinpoint which settings is affecting it. just a quick update. We have recently updated the difficulty presets so that the Waypoints flag is now set to Fade out on Regular difficulty and both Waypoints and Commands flags are now hidden on Veteran difficulty. We do believe that is more suitable default setup for given difficulty options. Would you agree ? The recent change to Regular difficulty preset changing Waypoints visibility to Fade out was reverted. On Regular difficulty waypoints are once again always visible, setting was set back to Show. Waypoints appearance, mechanics and both official and community content were designed around the presumption waypoints are visible on Regular. Changing that at this point would net more issues than benefits.